I have seen many games and tech companies fail even though their product is better. Related, I have written why fast following is almost always a doomed strategy. A classic article from 2006 in the Harvard Business Review, “ Eager Sellers and Stony Buyers” by John Gourville, does a great job of explaining why new products need to be 9X better to disrupt and succeed. There are thousands of companies trying to build a better mousetrap, be it a more appealing version of Clash of Clans, a better taxi service than Uber or a better marketplace than eBay. While research has shown that businesses that introduce new products are more likely to flourish than those that do not, new products fail at a rate of 40-90 percent depending on the category. One study showed that 47 percent of first movers failed, meaning that approximately half the companies that pioneered new product categories later pulled out of those businesses. These statistics beg the question: “Why do consumers fail to buy innovative products even when they offer clear improvements over existing ones?” Few would question the objective advantages of many innovations over existing alternatives, but that is often not enough for them to succeed. To understand why new products fail to live up to companies’ expectations, Gourville delved into the psychology of behavior change. New products often require consumers to change behavior, which entails costs for the consumer. Consumers incur transaction costs, such as the installation fees they have to pay when they switch from cable broadband Internet delivery to DSL. Consumers also face learning costs, such as when they shift from playing Quake to Halo. People sustain obsolescence costs, too. For example, when they switch from Hay Day to Dragonvale, everything they have built in Hay Day becomes useless. These are costs that are easily anticipated. What is often neglected when projecting the uptake of a new product or game are the psychological costs tied to behavior change. Many products fail because of a universal, but largely ignored, psychological bias: People irrationally overvalue benefits they currently possess relative to those they do not. The bias leads consumers to value the advantages of products they own more than the benefits of new ones. It also leads executives of the disrupting company to value the benefits of innovations they have developed over the advantages of incumbent products. Executives overvalue their innovations and then must predict the buying behavior of consumer while consumers irrationally overvalue existing alternatives. The results are often disastrous: Consumers reject new products that would make them better off, while executives are at a loss to anticipate failure. We often see this in the game industry, where games that for all intensive are better than ones already in the market fail because players do not switch. Gourville points out that the belief, often held in economics, that people will adopt new products that deliver more value or utility is fundamentally flawed. Citing the research of two of my heroes, Daniel Kahneman and Amos Tversky, Gourville shows that people value choices very differently than the above belief. First, consumers evaluate the attractiveness of an alternative based not on its objective value but on its perceived value. Second, consumers evaluate new products relative to a reference point, usually products they already using. Third, people view any improvements relative to this reference point as gains and treat all shortcomings as losses. Most importantly, losses have a far greater impact on people than similarly sized gains, called loss aversion. Studies show that most people will not accept a bet in which there is a 50% chance of winning $100 and a 50% chance of losing $100. The gains from the wager must outweigh the losses by a factor of between two and three before most people find such a bet attractive. Similarly, a survey of 1,500 customers of Pacific Gas and Electric revealed that consumers demand three to four times more compensation to endure a power outage—and suffer a loss—than they are willing to pay to avoid the problem, a potential gain. The status quo bias is another element of biases tied to gains and losses. In a 1989 paper, economist Jack Knetsch provided a compelling demonstration of what economists William Samuelson and Richard Zeckhauser called the “status quo bias.” Knetsch asked one group of students to choose between an attractive coffee mug and a large bar of Swiss chocolate. He gave a second group of students the coffee mugs but a short time later allowed each student to exchange his or her mug for a chocolate bar. Finally, Knetsch gave chocolate bars to a third group of students but much later allowed each student to exchange his or her bar for a mug. Of the students given a choice at the outset, 56% chose the mug, and 44% chose the chocolate bar, indicating a near even split in preferences between the two products. Logically, therefore, about half of the students to whom Knetsch gave the coffee mug should have traded for the chocolate bar and vice versa. That did not happen. What the researchers saw was that eleven percent of the students who had been given the mugs and ten percent of those who had been given the chocolate bars ended up wanting to exchange their products. To approximately 90 percent of the students, giving up what they already had seemed like a painful loss and shrank their desire to trade. This shows how people overvalue the status quo rather than pursuing what should be their top option. Innovations and behavior change. The successful adoption of an innovation often involves trade-offs. While consumers may obtain highly desirable new features by buying an innovation, they often must give up some of the benefits of the incumbent product. Consumers rarely view these trade-offs as simple behavior changes; they see them as gains and losses. Provide a consumer with a new benefit, and she will see it as a gain. Take away a benefit, and she will see it as a loss. Most innovative products suffer from a gain-versus-loss syndrome. Consumers and behavior change. Users and players view products they own or use regularly as part of their endowment. Thus, they assess innovations in terms of what they gain and lose relative to those existing products. As a result, the losses consumers will incur in switching to Android phones, obtaining telephone services from VOIP providers, and playing games on a phone will have a far greater psychological impact than will the gains from using them. As pointed out earlier, consumers overvalue losses by a factor of roughly three. Therefore, it’s not enough for a new product simply to be better. Unless the gains far outweigh the losses, consumers will not adopt it. Companies and behavior change. Executives are also biased, but in their case in favor of new products. Having worked on a new product for potentially years, executives and game developers operate in a world where their innovation is the reference point. They are convinced that the product works, they recognize the need for it, and they are keenly aware of the shortcomings of existing alternatives. Not having the features that their innovation provides seems to the developers like a shortcoming, and having the features that the incumbent provides does not seem essential. Several problems arise when executives’ reference points shift, and they adopt the innovation-as-status-quo perspective. They fall victim to the endowment effect just as consumers do. They overvalue the benefits of their innovations by a factor of three. 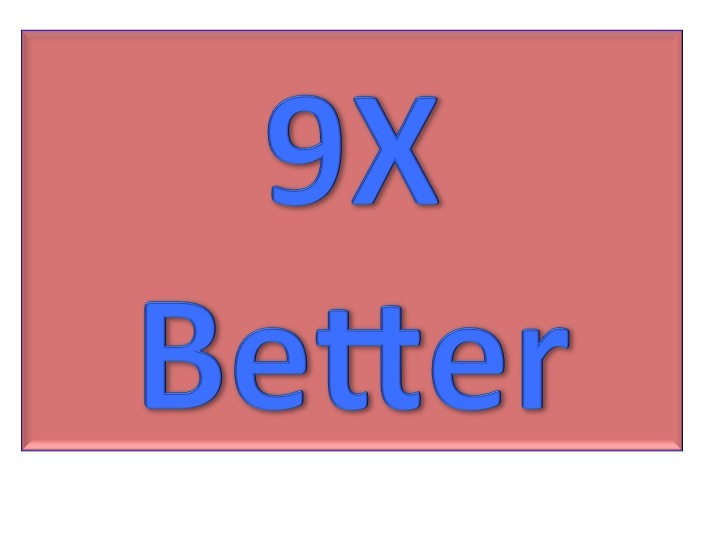 The combination of user bias and executive bias leads to the 9X effect. There is a fundamental problem for companies that want consumers to embrace innovations: While developers are already sold on their products and see them as essential, consumers are reluctant to part with what they have. This conflict results in a mismatch of nine to one between what innovators think consumers want and what consumers truly desire. In some ways, though, it is an oversimplification to say you need to make a product 9X better to disrupt. Instead, the understanding of the difficulty to move consumers several options (not mutually exclusive) to creating a smash hit. Patience. The simplest strategy for dealing with consumer resistance is to brace for slow adoption. To be successful, companies must anticipate a long, drawn-out adoption process and manage it accordingly. Aim for 10X improvement. Another approach to managing customer resistance is for companies to make the relative benefits of their innovations so great that they overcome the consumer’s overweighting of potential losses. Intel’s Andy Grove claims that to transform an industry rapidly, an innovation must offer benefits that are 10x, or ten times better, than what existing alternatives can provide. Eliminate the old. When facing unavoidable consumer resistance, a company can eliminate incumbent products. For example, if you are launching a new endless runner game, you should look into acquiring the developer Imangi and de-emphasizing its hit game Temple Run. This is obviously not a strategy for small companies but an option if you have deep resources. Make behaviorally compatible products. Companies can reduce or eliminate the behavior change that innovations require and thereby create smash hits. A good example was how Toyota got drivers to purchase a hybrid by minimizing adjustments drivers made when using the Prius. Seek out the unendowed. A company can also seek out consumers who are not yet users of incumbent products. This strategy is very consistent with how much disruption occurs, as discussed in my post about the Innovator’s Dilemma. By creating a product for a new market, you can then build a market for a new innovative product and eventually create a solution for the existing market. Find believers. A final option is for a company to seek out consumers who prize the benefits they could gain from a new product or only lightly value those they would have to give up. In the case of hydrogen-powered fuel cell vehicles businesses clearly must target environmentally conscious consumers. Less obviously, they can also target consumers for whom access to central refueling stations is not a problem. Consider an island like the Isle of Man or Nantucket, where a car owner might not ever drive more than 20 miles from town. In such places, consumers might value a network of gas stations less and value emissions-free transportation more than consumers on the mainland would. Consumers will underestimate the value of the new product by 3X. You and fellow executives will overestimate the benefits to consumers by 3X; thus, you need actually to be 9X better for consumers to switch. If your product is not simply 9 or 10 times better, you can reduce this number by making the new product something that creates less of a behavior change for users, appeals to a new market segment or finds customers who will see a disproportionate benefit from your product. Great post, Lloyd. You reference studies also written about by Dan Ariely, in Predictably Irrational, and Barry Schwartz, in The Paradox of Choice (two of my favorites), that talk about how people tend to irrationally overvalue what they have and are disproportionately averse to the costs of switching. Another example I’ve written about is how people are averse to losing their phone numbers when they switch carriers, and in that post I also reference Daniel Kahneman and Amos Tversky via Dan Ariely: http://blog.cellbreaker.com/ditch-carrier-take-phone-number/. Again, excellent post, Lloyd. Reblogged this on Part 11 Systems.